I’m always impressed by technology. I guess there is a geeky side to me that loves that we’re living in what was essentially was Science Fiction when I was a kid — and to me, that wasn’t all that long ago. I looked forward to us having communicators and Tricorders one day, like on Star Trek, but I knew that was still 400 years away. Star Trek, set in its 24th century timeline, seemed so far away. But today, we have futuristic technology in our pockets that we couldn’t even imagine when Star Trek aired.. We’ve come a long ways fast, and a lot has changed over just the few years even. We have better communication technology now than Kirk and his crew ever did. Today, we can share our discoveries with our friends and family instantly. Pictures, video, everything. We engage differently. It’s more dynamic. We have surpassed Science Fiction. The new thing is “Social Sharing“, or maybe it’s not all that new, just new for me… sort of. We tried some social media sharing widgets on my sites a few years ago, but social media was still in its infancy and it was cumbersome and generally less-than-impressive. Now, it’s powerful, and really kinda cool. It makes social sharing easy. So, even that has come a long ways in just the last few years. Sheesh, I can barely keep up sometimes. You know, there are now one Billion web sites in the world. One Billion, with a capital “B” kinda Billion. That’s a lot. That’s a lot of choices too. I know you could be visiting any web site in the world right now, so I appreciate you being here, visiting my site, and looking at my art. 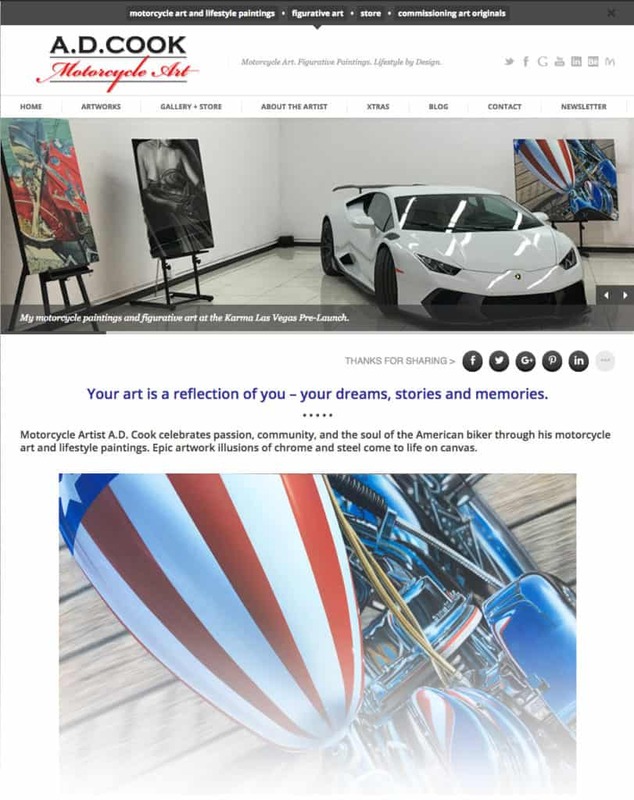 If you’re new to my site, I create motorcycle art and figurative art and write great Blog posts with lots of fun pics – mostly about art, the motorcycle lifestyle, exotic cars and life from an artist perspective in Las Vegas. Overall, an eclectic collection of stories of my journey through life. If you like something on my site, please feel free to share it on any of your social media..
It’s easier than ever to share my art and stories. Look for the “THANKS FOR SHARING” buttons at the top of most pages and to the right of all pages at ADCook.com (ADCFA.com). Log into your social media and click. Done.